Powers/Abilities: Maxam can grow in size and strength up to Class 100, at which point he is virtually indestructible. He is immune to telepathic assault. In his normal state he is a mediocre warrior, though he can be pushed into a savage, frenzied state in which he is virtually unstoppable. He also has knowledge of sophisticated technology. He had rocket units on his boots that allowed him to fly. He briefly held the Time Gem, which unlocked his memories. Presumably if he'd held it longer he could have eventually accessed its full powers. Height: (Normal) 5'10"; (Maximum) 8'2"
Weight: (Normal) 175 lbs. ; (Maximum) 1275 lbs. (Warlock and the Infinity Watch#41 (fb)) - As a child, Maxam and his friend Zhang performed a test for the Badoon Master Ecclaw. Maxam destroyed the robot pursuing them by planting a bomb on its leg. Afterwards, they asked Master Ecclaw where the other people were, but Ecclaw ignored the question and continued with their other lessons. (Warlock and the Infinity Watch#41 (fb) - BTS) - Maxam accessed a hologram of a beautiful human woman from Master Ecclaw's files. He often stared upon the image, admiring its beauty. (Warlock and the Infinity Watch#41 (fb)) - When Master Ecclaw caught Maxam viewing the hologram, he took both Maxam and Zhang to a massive graveyard, telling them how the Intergalactic Alliance had been destroyed, along with Earth, a century ago. Sterile and/or sick survivors had come to be cared for by Ecclaw, but eventually Maxam and Zhang were the sole survivors. Ecclaw revealed the Magus as the cause of the massive deaths, and he also revealed that his time displacement unit was intended to send either Maxam or Zhang into the past to target the Magus in his larval stage, as Adam Warlock. "Kill this man and you shall save the universe." (Warlock Chronicles#6 (fb) - BTS) - Maxam's powers were a result of being genetically enhanced. (Warlock and the Infinity Watch#26 (fb)) - BTS) - Maxam was implanted with a number of powerful psychic barriers, resulting in a virtual fortress protecting against psychic intrusion. (Warlock and the Infinity Watch#12 - BTS) - Via accessing her Time Gem, Gamora had a vision of a man (Maxam) standing over the prone--seemingly deceased--form of Adam Warlock. (Warlock and the Infinity Watch#15 - BTS) - Eternity told Warlock he would soon encounter five unique beings: (1) A being in need of a soul, (2) A being entangled in a web of past and future woes, (3) A being who would touch his heart, (4) A being whose trust Warlock would betray, (5) A being made of the terrible good within Warlock (see comments). (Warlock and the Infinity Watch#16) - Maxam's unconscious body appeared on the beach of Monster Island in a brilliant flash of light. Recognizing him as the man from her vision, Gamora recommended they kill him immediately. 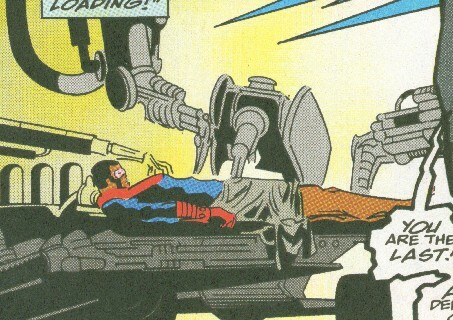 (Warlock and the Infinity Watch#17 (fb) - BTS) - Maxam was taken to the sick bay in the Infinity Watch's castle. Gamora removed his belt and found the inscription "Maxam" (or that's what they translated it as), and so she dubbed him Maxam. (Warlock and the Infinity Watch#17) - Drax roused Maxam, who had no idea who he was or how he had gotten there. Even with the Mind Gem, Moondragon was unable to read his mind, as she was rebuffed by what seemed to be an artificial barrier. The Watch members distrusted him, and Pip provoked a fight, during which Maxam became progressively bigger and stronger. Though he merely sought an end to the conflict, Maxam was pushed into fighting back, and he took out Pip and Gamora, proved immune to Moondragon's assault, and cast Drax far away into the ocean. However, as soon as he caught sight of Warlock, he was filled with blind hate and flew to the attack. A karmic blast from Warlock's Soul Gem incapacitated him, after which Maxam regained his mind, though he had no idea what made him go after Warlock. Curious as to the mystery of Maxam, Warlock offered him a place at his castle while they unraveled his mystery. Having no place to go, Maxam accepted, the rest of the Watch, especially Gamora, remained highly suspicious of him. (Infinity Crusade#1/Warlock and the Infinity Watch#18) - The Watch tested Maxam's strength, finding him "near Drax's non-adrenalined peak...in a class with the Hulk." Shortly thereafter, the Watch saw Gamora vanish into a portal (to the Goddess) and then found that Moondragon and Adam Warlock were missing as well. (Warlock and the Infinity Watch#18) - With the usual leaders out of the picture, Pip tried to establish himself as the new leader of the Infinity Watch. Realizing Pip was a poor choice, Maxam nominated himself, but Pip manipulated Drax into voting for him, and Pip took charge. Pip brought Reed Richards to gather intelligence on what was going on, and Maxam convinced Reed to stay and help. From Warlock's Orb of Eternity they learned of the Goddess and her Cosmic Containment units. However, when Reed refused to allow Pip to lead a mission to solve the mystery of the Goddess, Pip accused him of mutiny and attacked him. Maxam restrained Pip, and everyone eventually agreed that Reed was best to lead the mission. 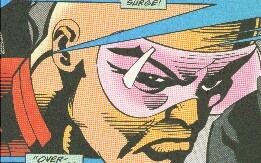 Pip transported Maxam, Reed, and Drax to Avengers headquarters, where they joined a meeting of Darkhawk, the Hulk, Nomad (Jack Munroe) and the remaining members of Alpha Flight (Aurora, Northstar, Vindicator, Wildheart, Windshear), the Avengers (Iron Man (Tony Stark), She-Hulk, Spider-Woman (Julia Carpenter), Vision), Fantastic Four (Human Torch, Mr. Fantastic, Thing), New Warriors (Firestar, Night Thrasher, Nova, Rage), X-Factor (Forge, Havok, Polaris, Quicksilver, Speedball, Strong Guy), the X-Men (Beast, Cyclops, Jean Grey, Iceman, Professor X, Psylocke, Rogue, Wolverine). (Infinity Crusade#2) - Upset by the disappearance of the Invisible Woman, the Thing mistakenly assumed Maxam to be the mastermind of the plot and accosted him, leading Drax to punch the Thing, which degenerated into a massive brawl. 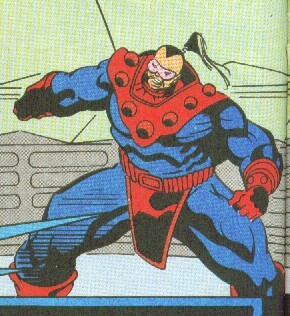 Reed broke up the fight and introduced Maxam to the others, though Maxam for some reason recognized the Vision. When Aurora reverted to her Jean-Marie personality, she was drawn to the Goddess' Paradise Omega base, and Reed, Iron Man, and the Vision allowed her to guide them to Paradise Omega via an Avengers Quinjet, but the Goddess soon banished them back to Earth. (Warlock Chronicles#2) - Warlock recruited Thanos to assist against the Goddess. Thanos viewed the alliance of heroes in Avengers Headquarters. (Warlock and the Infinity Watch#19) - At Avengers Headquarters, Maxam joined with the Hulk, Rage, Thing, Speedball, Rogue, and Wolverine in forcing the malodorous Pip to take a bath. Later, while discussing Maxam's memory gaps, Iron Man pricked Maxam's finger, testing his blood and confirming him to be human. Continuing to assist with the scanning equipment, Maxam rebuffed Pip's attempt to make a suggestion. (Infinity Crusade#3) - Maxam was still working on the scanning equipment when the Absorbing Man arrived and announced his surrender. Later, after Reed Richards had shared intelligence gleaned from Uatu the Watcher, the heroes debated on if and how they could (or should) stop the Goddess. They ultimately agreed that the Goddess would steal the free will from the universe and must be stopped, but shortly thereafter Moondragon used her Mind Gem to send Professor X into a comatose state. 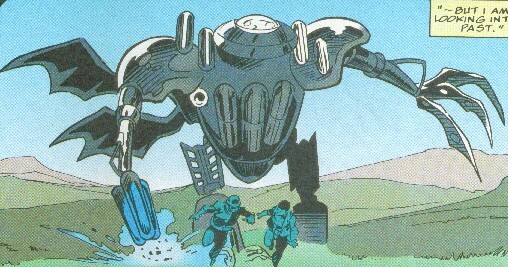 Reed announced the completion of his Harmonic Disruptor designed to disable the Cosmic Containment Unit, after which the heroes took a pair of immense ships and departed for Paradise Omega. Meanwhile, Pip, having learned of the Cosmic Containment Units (now a giant Cosmic Egg), teleported to Paradise Omega, touched the Egg, and turned the Goddess into salt, leaving himself in charge of their vast power. (Warlock Chronicles#3 - BTS) - Warlock and Thanos learned of the Goddess' true plan: universal annihilation to abolish all sin. 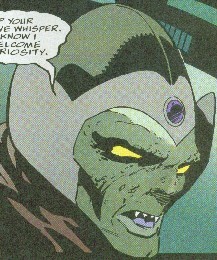 (Warlock and the Infinity Watch#20) - Within the ships, a number of the heroes expressed distrust of Maxam, Pip, and the rest of the Watch. Wolverine noted that Maxam had no scent. Adam Warlock arrived on Soul World, intending to seek the Magus' aid against the Goddess. Silhouette ambushed Pip, knocking him out, and restoring the Goddess to life and power. (Infinity Crusade#4) - Reed Richards and Iron Man discussed plans for the upcoming battle against their mind-controlled allies. Thanos and the Silver Surfer (who had recently regained his will) announced that he had a plan against the Goddess. Though he refused to share the details of his plan, he revealed his intent to provide a distraction for the heroes and his need for the telepathic power of Professor X (which he could access even with Professor X comatose). Overloading his body with cosmic energy, the Silver Surfer crashed into and destroyed Paradise Omega's defensive satellite. Thor then arrived to fight the heroes, and he was engaged by the Hulk and Drax, though the Hulk's propulsion unit was soon destroyed and he was slowly pulled into Paradise Omega's gravity. (Warlock Chronicles#4 - BTS) - Warlock failed to gain the Magus' aid, and so he departed Soul World. (Warlock and the Infinity Watch#21) - Battling with Drax distracted Thor so that the other heroes could land on Paradise Omega. Moondragon's efforts to force Thor's alliance only caused him to throw off the Goddess' control, though he persisted in the senseless battle against Drax. (Infinity Crusade#5) - Arriving on Paradise Omega, Maxam was partnered with Rogue, who soon fell before Hercules. 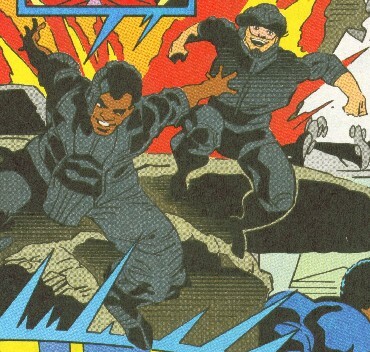 The Invisible Woman contained Maxam inside a force field, but Maxam continued to expand until the field shattered and the Invisible Woman passed out from the backlash. Maxam then tossed Hercules a great distance away. 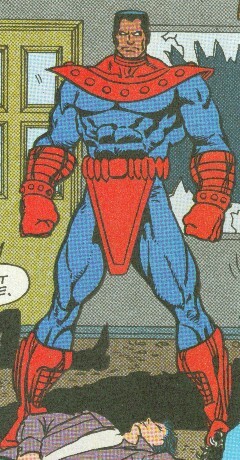 Maxam later caught up to Wolverine, who was receiving a beating from Wonder Man. Maxam ambushed Wodner Man, smashing him into unconsciousness with a single blow. Maxam and Wolverine were then confronted by Sasquatch and Gamora. Wolverine took out Gamora, and Sasquatch was flattened by the Hulk (having dropped in from his orbit). USAgent then confronted and dropped Wolverine, but Maxam smashed him against a tree. Sleepwalker next arrived to battle Maxam, but then the Goddess' cosmic cleansing flame began. (Warlock Chronicles#5 - BTS) - Exploring the depths of his own soul, Warlock learned that he could stop the Goddess by accepting her back into him. 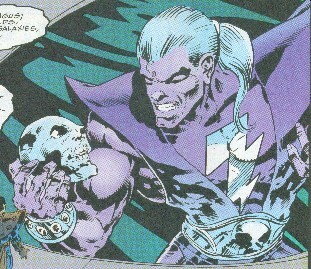 (Warlock and the Infinity Watch#22) - Warlock entered the core of the Goddess' inner self, but found that even there, with his Soul Gem, he could not overpower the Goddess' black heart. (Infinity Crusade#6 (fb) - BTS) - Realizing he could not stop the Goddess in time, nor could Thanos breach her defenses in time, Warlock instead caused her to see an illusion of galactic destruction a mere moment before she could institute the real thing. (Infinity Crusade#6) - Flame seemed to engulf the universe, only to fade, leaving everything normal again. Adam Warlock and Thanos then joined with Professor X into thwarting the Goddess, casting her spirit into the Infinity Gem. The heroes all returned to Avengers Headquarters before Thanos destroyed the Cosmic Egg and Paradise Omega. Warlock and the Watch departed for Monster Island before the heroes could attack Warlock for his involvement in the creation of the Goddess. (Warlock Chronicles#6) - Moondragon tried to probe Maxam's mind to no avail. Later, Moondragon told Maxam of Drax's origins, and Warlock told Maxam of his communication of Eternity and his suspicions that Maxam was one of the beings Eternity had foretold. Pip told Maxam that he was starting to believe that he truly did have amnesia, and he expressed his appreciation for helping against the Goddess. Pip then obtained civilian (well, western) clothes for himself and Pip and brought him to the country and western bar Laredo in a seedier side of Manhattan. Maxam's dark complexion disturbed some of the customers who started a fight with Maxam. Though he couldn't imagine why anyone cared about the color of one's skin, Maxam fought back, easily clearing the whole bar. Following a call for assistance from Warlock, Pip returned Maxam to Monster Island, after which Adam had Pip transport him away. (Silver Surfer III#86 - BTS) - Thor defeated the Silver Surfer and was confronted by Adam Warlock and Pip. (Warlock and the Infinity Watch#23 - BTS) - Warlock and the Surfer were ultimately forced to flee from Thor. (Thor I#469) - Maxam and the rest of the Watch--except Drax who was playing Jacks--questioned Pip when he tried to convince them that they should go help Warlock even though he had turned down their help. The Watch declined Pip's request, but when Pip tried to convince Drax, the intellectually-stunted behemoth flipped out upon mention of Thor, and he strangled Pip, forcing Pip to take him to Thor. Pip brought the rest of the Watch, too. Drax attacked Thor, but when Moondragon tried to purge Thor over the maddening aspect of the Valkyrie, she instead succeeded only giving the Valkyrie a physical form and life of her own. The Valkyrie and Thor fought the Watch, and Drax and Maxam teamed up against Thor, who held his own against them, eventually even punching Drax in the stomach, causing him to disgorge the Power Gem, which Thor took for himself. Pip then teleported the Watch away to get Warlock's help. (Silver Surfer III#87) - While Warlock and the Surfer enlisted the aid of Dr. Strange, Pip and the rest of the Watch came crashing into Strange's sanctum, sharing the recent FUBAR of the Thor situation. Strange then transported the entire group to Asgard. (Warlock Chronicles#7) - Arriving in a deserted region of Asgard to avoid encountering Thor, Strange and the Watch then headed towards Asgard city, while Beta Ray Bill and Sif--who felt that Asgard would kill Thor if he learned of his Warrior Madness--took steps to stop them. Asgard attacked the Watch, and Sif assaulted Geirrodur and duped him into sending an army of Trolls after her, leading them instead to the Watch. Drax and Maxam eventually got the better of Bill, but Sif teleported Bill away as the Trolls attacked them. The large army of Trolls gradually picked off the Watch members until only Drax and Maxam were left. A small troll then hurled a gas weapon at them, and they both succumbed to the vapors. (Warlock and the Infinity Watch#24) - Though not Asgardian, Pip nonetheless was awarded the right to trial by combat. Pip was allowed to pick a surrogate, and--for various reasons, such as not knowing whether he could trust Maxam or whether he could go to the limit--Pip chose Warlock. With the threat of killing the rest of the Watch at the first sign of deceit, Warlock battled Olik (brother of Ulik). Warlock prolonged the struggle until Pip could take out the dungeon guard, and then he dropped Olik with a karmic blast. The rest of the Watch (plus the Surfer and Dr. Strange) were freed, and they escaped Castle Grimlock and headed towards Asgard City again. (Thor I#470) - As the Infinity Watch, Dr. Strange, and the Silver Surfer closed in on Asgard city, Moondragon sensed Thor's presence. They confronted Thor and the Valkyrie, but the Power Gem allowed Thor to easily overcome a combined assault from Maxam, Drax, and the Silver Surfer. As Thor continued to fell his foes, the Surfer flew Pip up to Thor, and he transported Thor, the Valkyrie, and the Surfer aboard Thanos' ship. (Silver Surfer III#88) - The Surfer defeated the Valkyrie, and--after a protracted battle--Thanos trapped Thor within a stasis field. Dr. Strange transported the rest of the Watch aboard Thanos' ship, and they made plans to cure Thor's madness. (Warlock Chronicles#8) - Maxam restrained the Valkyrie until she could be contained within an energy field, and then Dr. Strange, Moondragon, and Thanos restored the Valkyrie to within Thor's mind. However, in the process, Thanos' instrumentality was destroyed. Thanos and the heroes realized that Odin was their only chance to cure Thor. (Warlock and the Infinity Watch#25) - Thanos, Dr. Strange, the Silver Surfer, and the Infinity Watch arrived in Asgard, and Thanos provoked a battle against the forces of Asgard. Maxam took out Hogun and others, but then Thanos called Maxam to watch over Thor's prison to allow Thanos to enter the conflict himself. After a fierce struggle between Thanos and Odin, Sif intervened, explaining that the invaders were seeking to help Thor. Odin then tried and failed to cure Thor's madness. (Thor I#471) - Maxam was present as Odin restored Thor's sanity, and as Thor thanked all those who had helped him, returning the Power Gem to Drax. Pip transported the Watch, Dr. Strange, and the Surfer away, while Thanos left under his own means. (Marvel Swimsuit Special#3) - Maxam and the rest of the Infinity Watch attended the Water Festival of the Inhumans. (Warlock and the Infinity Watch#26) - Back on Monster Island, Adam Warlock decided that Maxam's amnesia must be resolved before he could become a liability to the group. Warlock used his own Soul Gem combined with Moondragon's use of the Mind Gem, in conjunction with Drax's Power Gem to transport the four of them to a psychic plane of existence. Though Maxam was a willing participant, his psychic barriers continued to provide massive resistance, which caused Maxam great pain as Moondragon forced her way past them. They gained a brief glimpse of Maxam's history before they were pulled into a psychic trap--a mental maelstrom created by the presence of psychic power great enough to breach his defenses; Moondragon was forced to pull them all back to reality to avoid brain damage. Maxam remembered a Badoon figure from his past, and Moondragon pointed out that the Badoon had slain Gamora's parents. Shortly thereafter, Maya--sent by Count Abyss--arrived on Monster Island, but she was knocked out by the Avengers, who were mind-controlled by the Man-Beast and sent to destroy the Watch. Maxam discovered the Avengers presence and warned the rest of the Watch, and the Avengers attacked the Watch when they confronted the invaders. 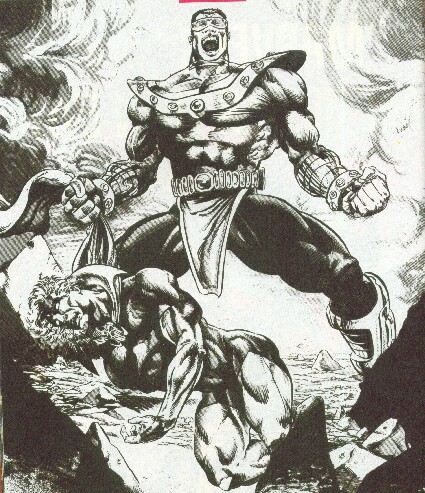 (Warlock and the Infinity Watch#27) - Maxam faced the combined power of Hercules and Thunderstrike, until Moondragon blasted Thunderstrike into unconsciousness. Pip then teleported an immense rock above Hercules, but it fell on top of Maxam instead, while Hercules escaped unscathed. Eventually the Avengers were defeated--with the aid of the Vision, who had resisted the mind control in the first place, and Moondragon cleared the Avengers' minds of the Man-Beast's influence (though they were not aware that the Man-Beast was the perpetrator). As the heroes discussed the matter, Maxam remained trapped under the rock, asking if there was anyone out there to help him. (Warlock and the Infinity Watch#28 (fb) - BTS) - Maxam was freed from the rock. (Warlock and the Infinity Watch#28 (fb) - BTS) - The Avengers and Watch members found Maya and brought her into Warlock's castle. (Warlock and the Infinity Watch#28) - Maxam was left behind on Monster Island when Warlock and Pip joined some of the Avengers in confronting "Senator Munson" (the Man-Beast). Warlock later returned and announced the Man-Beast's involvement and defeat, while Pip introduced the now-awake Maya to everyone. (Warlock and the Infinity Watch#29) - Maxam sat back as Maya began to introduce herself, and he was knocked to the ground by her "dance of unreality" when Gamora assaulted her for being connected to Count Abyss. Maxam later followed Gamora and Pip as they tried to spy on Warlock and Maya's private deliberations. He was as shocked as the rest when they found Warlock and Maya making out, a result of Maya's love potion. (Warlock and the Infinity Watch#30) - Maxam was present as Warlock realized the spell he was under and forced himself to resist it, as well as when Dr. Druid was summoned and failed to break the spell. Count Abyss later sent his minions to assault the Watch. Maxam and the rest of the Watch fought back against them, but they served as the intended distraction, and Abyss appeared and abducted Maya back to his realm. (Warlock and the Infinity Watch#31) - After Warlock learned of Count Abyss' origins from the Orb of Eternity, Maxam and the rest of the Watch joined him in traveling to Abyss' realm to rescue Maya. There they were confronted by Darklore and Me'erlyn. (Warlock and the Infinity Watch#32) - Darklore and Me'erlyn joined the Watch in invading Darklore's castle, but he overpowered them all and stole Warlock's Soul Gem. When Maxam attacked Count Abyss, the evil ruler simply wiped his mind clean, causing him to collapse in a heap. (Warlock and the Infinity Watch#33) - Warlock, Darklore, and Me'erlyn defeated Count Abyss, restoring all those affected by his power. Maxam attended the victory celebration on Egolix-7, which had been freed from Abyss' tyrannical rule. (Warlock and the Infinity Watch#34) - Back in their Monster Island castle, Maxam worked on repairing the damage done by Abyss' demons. When Drax tried to help, Maxam stopped him from touching a fragile piece of equipment, slapping his hand away and hurting his feelings. After learning that Drax had vanished, Maxam joined Gamora, Pip, and Moondragon in searching for him. Gamora continued to accuse Maxam of plotting against them, leading Maxam to yell at her, telling her he was as valuable to the team as she was--maybe more so. They located Drax just in time to watch him leave with his new friends, a group of monstrous creatures residing on the island. Later, Maxam listened to the Mole Man's complaints over the disappearance of some of his pets. Warlock then saw a vision asking for help, but none of the others saw it. (Warlock and the Infinity Watch#35) - When Pip suggested they just leave Drax alone until he came back on his own, Maxam and Gamora found themselves agreeing that they needed to find Drax. They were interrupted by the Mole Man, and then by a giant mutate under the control of Tyrannus. Warlock refused an alliance with Tyrannus, leading Tyrannus to send the mutates to attack the Watch. Maxam noticed that he and Gamora were fighting back to back, but she dispelled his thoughts of reconciliation by chewing him out for looking at her. Drax and his monster-friends returned, and Drax's empathic link with those mutates passed into the other mutates, who then turned against Tyrannus. (Warlock and the Infinity Watch#36) - Strange--a twisted magical aspect of Dr. Stephen Strange--arrived on Monster Island seeking to add the Infinity Gems to his collection of magic items. After Strange assaulted Pip and Gamora, Moondragon sensed his presence and summoned the others. Maxam fell before a single mystic blast, and Strange ultimately defeated the entire Watch, but he left them with the Gems after Warlock revealed that the Living Tribunal had decreed that the Infinity Gems could never again be used in unison. (Warlock and the Infinity Watch#37) - The being who had been appearing before Warlock revealed itself to be the soul of Firelord. Maxam told the rest of the Watch that Warlock no longer seemed to be up to leading the team, leading Gamora to go after him until Drax stepped in and prevented a fight. Warlock then appeared and led the Watch to Gato's Tavern in Pittsburgh, Pennsylvania to confront Zakaius, who had slain Firelord. After fighting off rowdy patrons of the bar, Maxam joined the others in fighting Zakaius, but a stray blast from Zakaius blew up a petroleum truck. 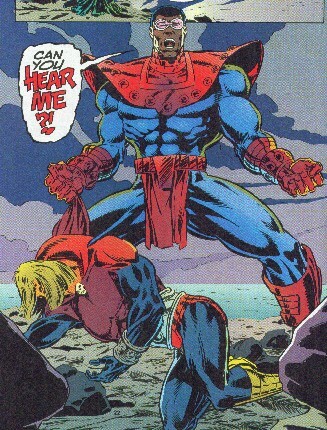 (Warlock and the Infinity Watch#38) - Repentant over the damage he had caused, Zakaius told Warlock of his origins and of Lord Domitian while the rest of the Watch rescued those close to the blast. Zakaius then transported himself and the Watch to the palace of Lord Domitian. When Zakaius appealed to Domitian's agent Kaef to seek a reprieve in the sentence on Firelord, Kaef struck Zakaius down, but Drax and Maxam then punched Kaef, knocking him far away. Domitian himself then confronted Zakaius and the Watch, opening a trap door below them that dropped them into a group of Domitian's army of undead cyborg alien criminal assassins (UCACA). As Maxam and the rest of the Watch fought the UCACA--noting that they had just fought monster-type armies a lot recently, Domitian renewed his power via his life force runes and then prepared to join the battle himself. (Warlock and the Infinity Watch#39) - Following Warlock's instructions to take Domitian out of the battle as quickly as possible, Maxam smashed a giant piece of equipment over Domitian...to no effect. After Domitian seriously injured Moondragon, Drax rushed to kill Domitian, and Maxam tried to stop him from forcing Domitian to expend the life runes that empowered him, which would destroy the souls of those held within the runes. Eventually Zakaius destroyed the machine that transferred the runes' power to Domitian. Afterwards, the Watch left the runes with Zakaius, who vowed to restore all of the life forces contained within the runes. They started with Firelord. (Warlock and the Infinity Watch#40) - While Moondragon was treated for her massive injuries, Warlock discussed a hopefully temporary new guardian for the Mind Gem. When Maxam suggested himself--both due to his having proven himself as a loyal ally and because it might help him restore his memory, Gamora objected violently. When Maxam commented that Warlock could make the decision because Gamora would do whatever Warlock said, Gamora angrily kicked Maxam across the room. Maxam apologized for his cheap shot, but when she continued to attack him, Maxam grew to full size and gave her the fight she was seeking. Gamora easily dodged Maxam's attacks initially, striking him at will, and Warlock felt he could not interfere because a karmic blast to one would leave that person vulnerable to a lethal assault from the other. The fight was ended by a burst of telekinetic energy caused by the merging of Drax and Moondragon's minds. Warlock criticized Gamora for attacking Maxam, and when she felt that Warlock was siding with Maxam over her, she quit the team. As she left she threw the Time Gem at Warlock and told Maxam that he had better hope their paths never crossed again. Warlock offered the Time Gem to Maxam. Thinking things through over the remainder of the day, Maxam pitied Gamora for being orphaned again, but he resolved to live up to Warlock's trust by safeguarding the Time Gem. However, as soon as he donned the Time Gem, his memories came flooding back to him. 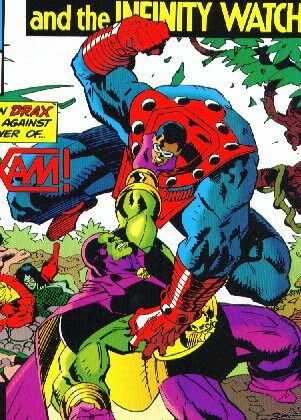 (Warlock and the Infinity Watch#41) - Maxam ambushed Warlock, and while Moondragon sensed this assault, Drax refused to leave her side to help Warlock. Efforts to appeal to their past friendship met with failure, but after Moondragon distracted Maxam with a psychic assault, Warlock dropped Maxam with a karmic blast. The Time Gem having pierced all of Maxam's defenses, Moondragon then read Maxam's mind and learned his motivations and origins. As they pondered how to deal with the situation, a gigantic tidal wave (caused by the raising of Atlantis) approached Monster Island. (Warlock and the Infinity Watch#42) - Moondragon wrapped steel girders around Maxam and psychically prevented him from breaking free. Maxam refused to accept Warlock's promises that the threat of the Magus was over, believing that the Magus could still someday escape and threaten the universe again. As the tidal wave approached, Moondragon and Warlock decided to leave Maxam behind to see if nature would resolve their dilemma. Warlock reached to take the Time Gem from Maxam's forehead. (Rune/Silver Surfer#1) - The extradimensional vampire Rune assaulted Maxam, stealing the Time Gem. Using the Gem to halt time, he then claimed the other five Infinity Gems and escaped with them. (Warlock and the Infinity Watch#42) - Without the Time Gem on his head, Maxam became immune to Moondragon's powers and he broke free and attacked Warlock. Lacking the Soul Gem, Warlock had no defense against Maxam's power. Maxam overpowered Warlock, but the tidal wave then struck. Hours later, Maxam awakened first, and he grabbed the unconscious Warlock and snapped his neck, killing him. Maxam then voiced the pain over hurting his friend though he had had no choice. His mission accomplished, Maxam returned to his own future timeline. However, Moondragon then revealed that she had--presumably while Maxam still held the Time Gem--placed a program in Maxam's mind that had played out the exact scenario he desired. With the loss of Maxam, with Moondragon's injuries, the tidal wave, and Gamora's departure, the Infinity Watch disbanded. Comments: Created by Jim Starlin, Tom Raney, and Keith Williams. 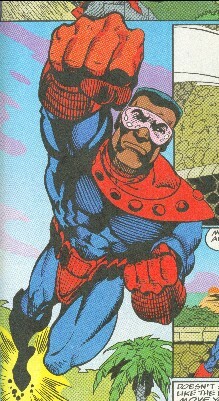 Maxam's name was first given on the "next issue" blurb of Warlock and the Infinity Watch#16. In the story in Rune/Silver Surfer#1, Maxam had just inherited the Time Gem from Gamora, but was taking a peaceful stroll through the wooded jungle, without a care in the world. Perhaps Rune actually used the Gems to warp time to alter events, but these events don't fit with Maxam getting a mad-on for Warlock as soon as he donned the Gem, nor do they fit with him wearing the Gem when first attacking Warlock, or with him wearing the Gem when assaulted and then mind-read by Moondragon (as wearing the Gem facilitated Moondragon's ability to affect Maxam's mind). So, I stick with the Infinity Watch version over the crossover (even though both were owned by Marvel). However, I don't see anything really wrong with Warlock's Soul World battle with Rune, as Rune could easily have erased memory of those events from Warlock's mind. Maxam has an entry in Marvel Legacy: The 1990s Handbook. Environment: Much of the universe laid in devastated ruins, though remnants of advanced technology persisted. History: An alternate future in which Adam Warlock became the Magus and conquered the universe, slaughtering the Intergalactic Alliance, along with Earth. Sterile and/or sick survivors had come to an unnamed planet to be cared for by Ecclaw, but within a century Maxam and Zhang were the sole survivors. Ecclaw trained Maxam and Zhang as warriors and sent Maxam into the past of Earth-616 to slay the Magus' earlier self, Adam Warlock. Maxam was eventually tricked into believing he had killed Warlock, and he returned to his future, which was presumably unchanged. An alternate future version of Adam Warlock, he conquered the universe, slaughtering the Intergalactic Alliance, along with Earth. Sterile and/or sick survivors had come to an unnamed planet to be cared for by Ecclaw, but within a century Maxam and Zhang were the sole survivors. A Badoon, he was one of the last survivors of the Intergalactic Alliance. On an unidentified planet he cared for the survivors, but within a century, only Maxam and Zhang remained. Ecclaw trained them as warriors, intending to send one of them back in time to destroy the Magus' "larval stage," Adam Warlock, intending that changing the past would save their universe. Under unspecified circumstances, Maxam was selected for this role, and Master Ecclaw granted him superhuman abilities, as well as devising powerful psychic barriers to prevent Warlock or his allies from learning his true mission. Childhood friend to Maxam, he was one of the last two remaining beings descended from those brought to be cared for by Master Ecclaw. It was to be either he or Maxam that was to be sent into the past to slay Adam Warlock. Maxam was chosen, and Zhang's fate is unknown. One might speculate that either Zhang did not survive the empowerment, or that he eventually faced Maxam in a battle to the death to determine the greater warrior. Because if one waits for the story that will explain this more fully, one better not hold one's breath, or one will become quite cyanotic. A hologram of a human woman, Maxam stole it from Master Ecclaw's files, and he dreamed of the day when he would meet a woman like that for real. At the time, he did not know that all of the woman had long since perished. Used in a training exercise by Master Ecclaw for Maxam and Zhang, it was destroyed when Maxam managed to attach a bomb to its legs.